Growing up, I never ate chicken salad. The first time I actually remember eating it was when I worked at this Italian restaurant during college. I was noticing that my tastes were changing, I was getting more adventurous with the foods I tried, and liking foods that I hadn't like growing up. So one day during the lunch rush, the chef makes fresh chicken salad with grapes and onions in it, and I decided to try some. It wasn't that great of chicken salad, but I fell in love with the taste and texture of chicken salad. There was just something about the contrast between the mayo, chicken, crunch celery and onions, and sweet grapes that was music to my taste buds. 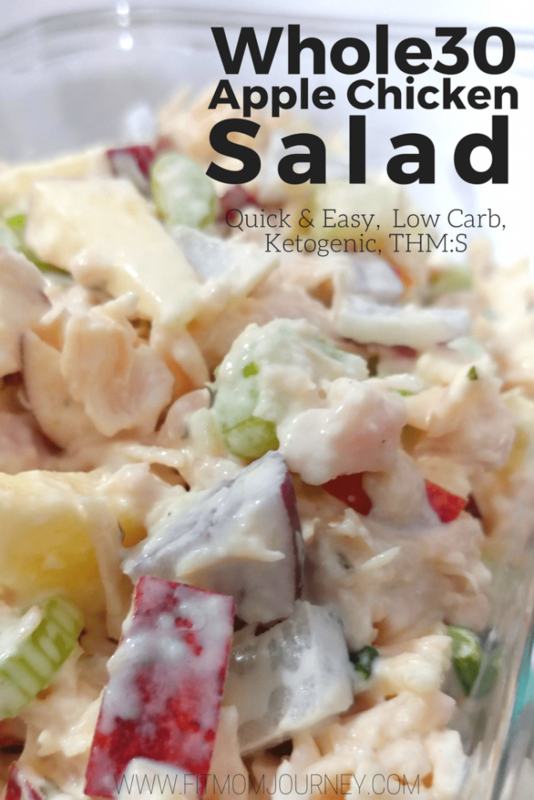 This recipe is based off of that balance of flavors, but I used Paleo Mayo to keep it healthy, as well as on-plan chicken, apples, onions, and celery. Honestly, I can't tell the difference between this Paleo, Whole30 Chicken Apple Salad and the unhealthy stuff. I like to either eat it straight out of the bowl – and I do, often – or on crunchy romaine lettuce leaves. It's also pretty easy to make. Just a bit of cutting on the celery, onions and apple, and then mixing it all together. I have actually found Whole30 compliant canned chicken which makes this recipe even less work. I can literally throw it together in 5 minutes, package it up, and have it for lunch all week. In this case, I used 1/2 of a chopped apple because I wanted to keep the carbs low to keep the recipe Ketogenic, but if you like more sweetness, don't want to use just half an apple, or don't care about keeping carbs low, then feel free to chop up the whole thing and throw it in there! Drain the chicken well, then add it to a bowl with the mayo, mustard, onion, apple, green onion, and a bit of salt and pepper. Divide into 3 servings and enjoy!